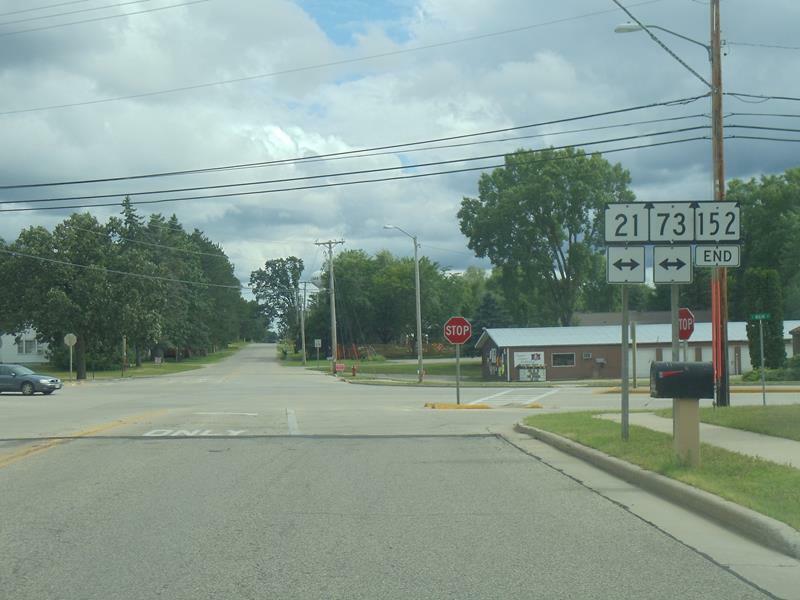 Western terminus: Waushara County, at Highways 21 and 73 in Wautoma. 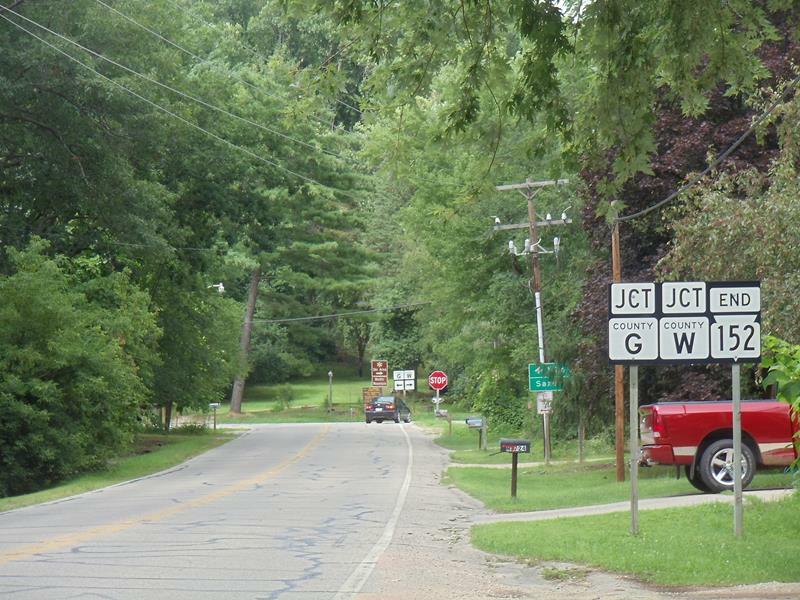 Eastern terminus: Waushara County, at County Highways G and W in Mount Morris. Quickie Summary: Wisconsin Highway 152 is a brief State Trunk Tour route – it’s quite hard to see almost on our state map here – that runs from Wautoma (which bills itself as the “Christmas Tree Capital of the World”) to the tiny town of Mount Morris, which hosts camps, forests, and the Nordic Mountain Ski Area. On this brief connector route off of Highways 21 and 73, you can enjoy some nice scenery, a 19th century dam and mill, and some nice topography amidst this glaciated area of central Wisconsin – plus a few cool things just beyond its finish. It may only be seven miles, there’s a lot of zigging and zagging on this lil’ State Trunk Tour. The Drive (West to East): We begin in Wautoma (pop. 2,218), the county seat of Waushara County. 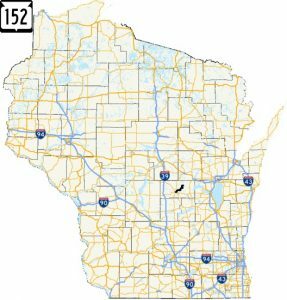 “Waushara” is a Native American name, believed to mean “good land” (but isn’t that what Alice Cooper said about Milwaukee in Wayne’s World??) Anyway, Wautoma bills itself as the “Christmas tree capital of the world” since The Kirk Company started growing and harvesting trees on over 10,000 acres in the area in 1953. The company, headquartered in Washington State, continues to grow trees for market and offers the opportunity to color trees in all sorts of shades – so maybe Wautoma is the “multi-colored Christmas tree capital” too? Lovers of historic buildings can head downtown and check out the Waushara County Courthouse, Waushara County Sheriff’s Residence and Jail on Ste. Marie Street. Listed on the National Register of Historic Places, the Waushara County Sheriff’s Residence and Jail is a brick Georgian Revival building built in 1908 which now serves as a museum of the Waushara County Historical Society. The Waushara County Courthouse (209 Ste. Marie Street) is a Classical Revival-style building built in 1928. They’re both one block south of Highway 21/73 (Main Street) along Ste. Marie in the downtown area. You’ll also find some cool antique shops and Graf’s Sweet Shop, in case you need a little sugar for your seven-mile journey on Highway 152. You need a throwback burger or shake, the Milty Wilty Drive-In will take good care of you in-season, just blocks to the east of Highway 152’s start via Main Street. Highway 152 itself begins a little further to the east, at Townline Road, which it follows briefly before turning east onto Mt. Morris Avenue. 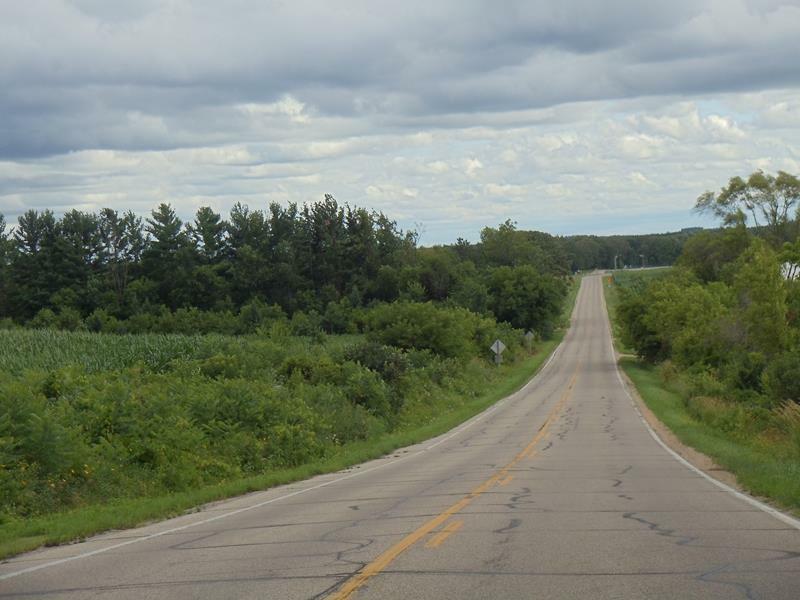 Then we have some zigging and zagging through peaceful, pleasant Wisconsin countryside in the midst of Waushara County. One of the few longer straight stretches of Highway 152. Lovely farmland abounds, even though a “mountain” lies ahead. The Mt. 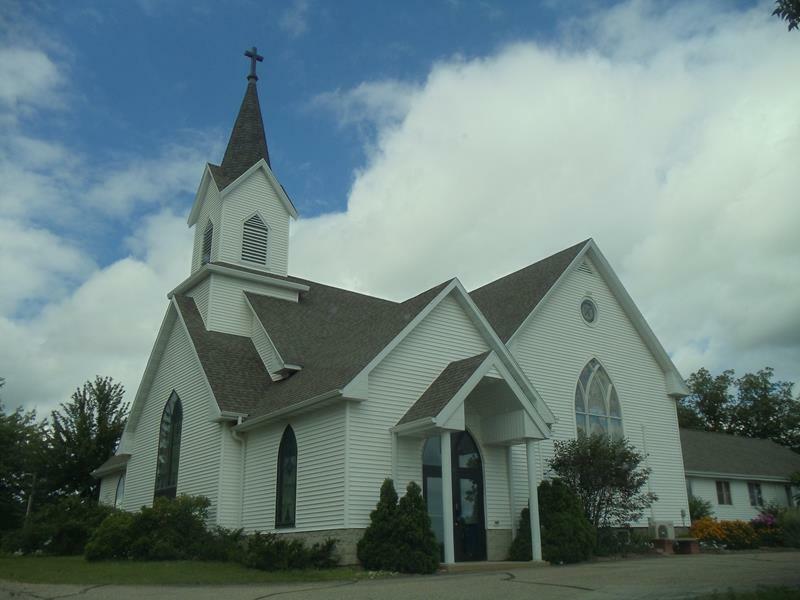 Morris Holden Lutheran Church is a great example of how a beautiful church in a rural area just adds to the sense of serenity as you drive. Highway 152 approaches Mt. Morris, an unincorporated town, and prepares to finish its short journey – but not before several areas of interest! As you enter Mt. 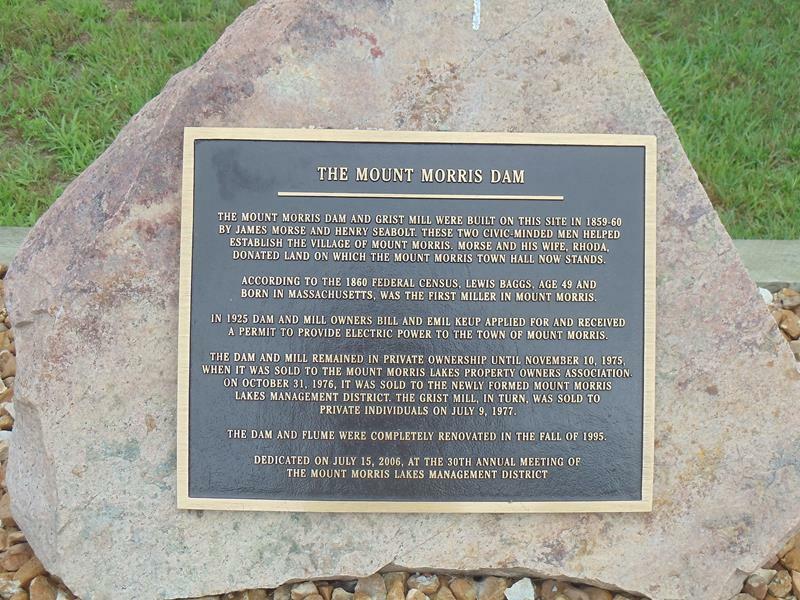 Morris (we’re intertwining “Mount” and “Mt.” here as we see fit) you’ll find a historic dam just off the road. 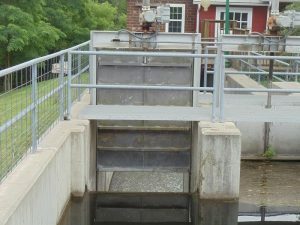 The Mount Morris Dam & Grist Mill was built in 1860 by two men (James Morse and Henry Seabolt) who helped found the town. Running through several ownerships through the years, the Dam and Mill started providing electric power to Mt. Morris in 1925. It was renovated in 1995 and you can enjoy how it is today by not only exploring it from the outside but by popping into the Mt. Morris Mill Coffee Shop (N3694 State Road 152, (920) 787-7830.) 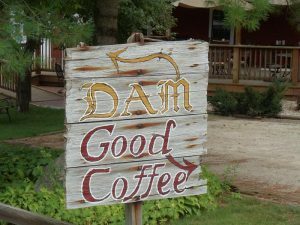 This charming coffee house, open seasonally, runs inside the mill and refers to itself as a “no rush zone” – even though they tend to fill customers with caffeine. 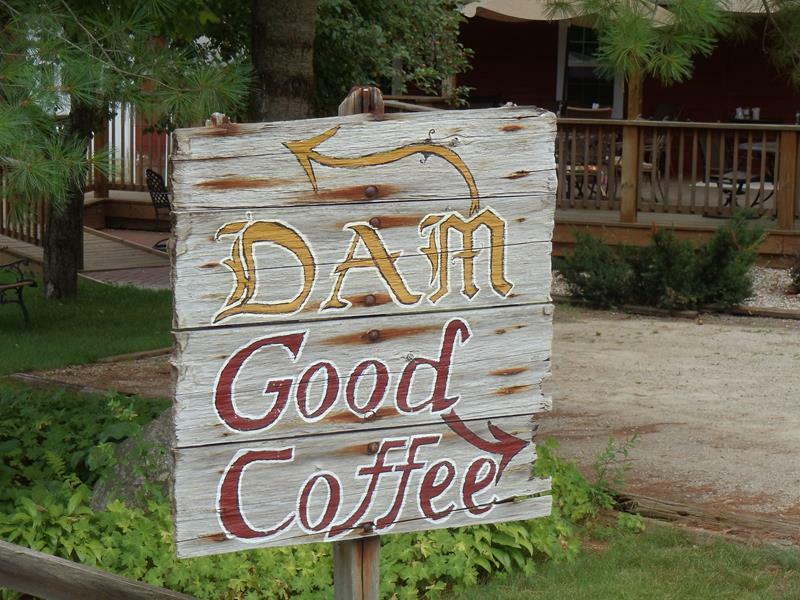 You can explore the interior of this historic space or walk around the lock and dam area outside; the directional sign (below) will tell you which way to go and describe their coffee at the same time. After just seven miles, several turns, beautiful farm and recreation land, camps, a lovely church, coffee, and a dam and mill, Highway 152 comes to an end. Not at another state, U.S., or Interstate highway, but two county roads, making it almost a “spur” on the state trunk highway system. County G takes you west and northwest; County W takes you northeast and north. 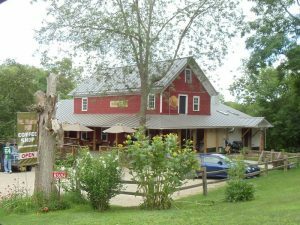 Either way, there are several points of interest within a very short drive – practically within eyeshot – of the eastern end of Highway 152. From Highway 152, just one-half mile to the west via County G you’ll find Mt. Morris Hills County Park. Developed in the 1960s by locals hoping to create a state park, this fine county offers some nice facilities from electricity and running water to all kinds of sporting fields along with 4.3 miles of hiking trails, which double in the winter for cross-country skiing. It’s a good place to have a little cookout, to; Morris Lake can be accessed via the town park across County G.
On a drive briefly to the east on County W, you’ll access Nordic Mountain (920-787-3324), an 18-run ski, snowboard, and tubing complex with a 265-foot vertical drop from the top of the hill to the start of the beginner’s area. All skis and snowboards must have metal edges, by the way. They offer two chair lifts and two conveyor lifts (one 80′, one 200′) and for visitors they offer overnight accommodations, a bar and restaurant focused on locally-sourced food and beer. For night skiiers, boarders, and tubers, 16 of the 18 runs are lit, and the runs range from black diamond to beginner. There’s also a Tubing Park and an Alpine Adventure Challenge, so there’s plenty to do here in winter. During the warmer months, mountain biking trails criss-cross and cover much of the 104 acres of Nordic Mountain, so there’s plenty to check out in every season. And that’s a good way to end Highway 152 on a high note! To get to this bridge from the end of Highway 152, Michael says the following: “Take W out of Mount Morris to Saxeville. Stop at the little park on the left as you come into town and you’ll find a bell that supposedly was taken from Union forces from Jefferson Davis’ plantation. I think the road to the left that the park is at the intersection with W is called Portage Rd. 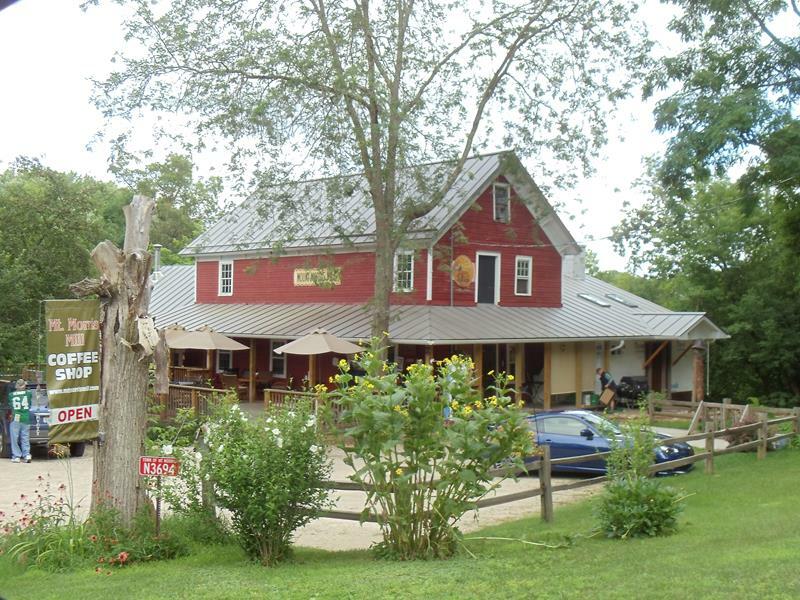 [It is, we checked — STT] Stop at the historic Ding Tavern for some bar food, then continue to the west and Covered Bridge Road will be on your right.” Thanks Michael! There’s always cool stuff just beyond on these State Trunk Tours. 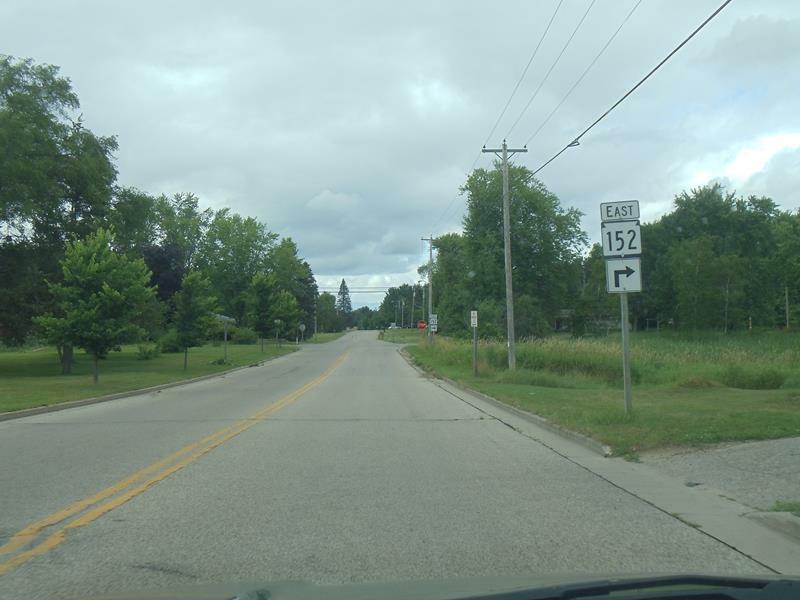 Unusual sign for the western end of Highway 152 in Wautoma, from the font to the “END” sign below the 152. 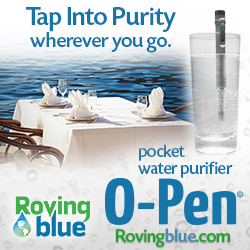 Yeah, we notice goofy things like that. 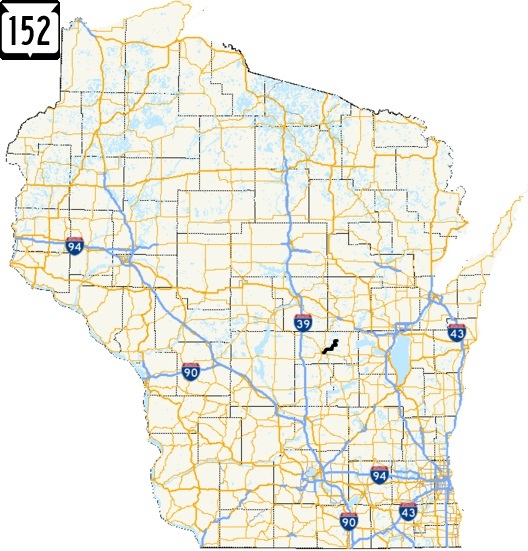 • Highway 152 is one of the few state trunk highways that ends at county roads without a direct connections to another state or Interstate highway; other examples include Highway 24 and Highway 155.